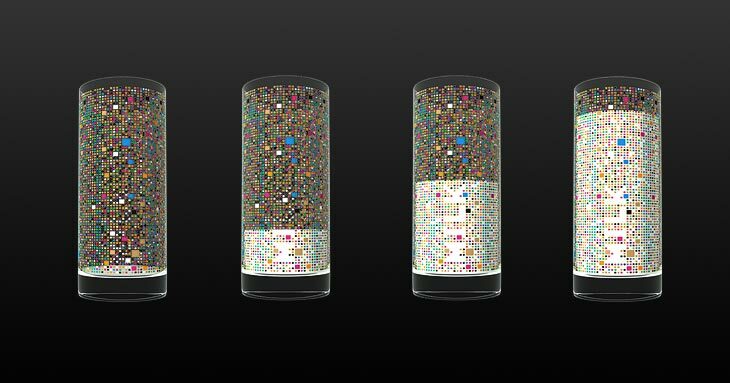 The Cipher Drinking glass is a concept gadget that uses a bunch of colours on the side of the glass to represent the sort of drink inside the glass. The drinking glass concept was designed by Damjan Stankovic and in all honesty, I doubt we will see them soon unfortunately. Anyway, the glasses as mentioned above, show the contents of what is inside the glass such as Orange, Milk or what ever. When empty a bunch of random squares can be seen on the glass as part of the design. Although I said the squares are random, apparently they are actually something to do with the liquid colour and when a certain colour of liquid is in the glass the correct sequence of colours lets the light through the wall of the glass. It’s unclear if they can be made as there aren’t many ideas by the designer on how it should work from what I can see. It would be cool if they could be made though!